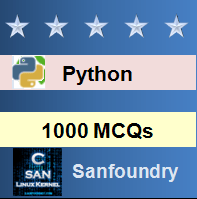 This set of Python Multiple Choice Questions & Answers (MCQs) focuses on “Lists-7”. b)	[1, 2, 3, 4]. Explanation: Append function on lists doesn’t return anything. Thus the value of b is None. 2. What will be the output when executed in python shell? Explanation: List b is just a copy of the original list. Any copy made in list b will not be reflected in list a.
a)	[13, 56, 17, , 45, 67]. b)	[13, 56, 17, 87, 45, 67]. c)	[13, 56, 17, 87,[ 45, 67]]. d)	[13, 56, 17, , [45, 67]]. Explanation: The append function simply adds its arguments to the list as it is while extend function extends its arguments and later appends it. 4. What is the output of the following piece of code? Explanation: (45) is an int while (45,) is a tuple of one element. Thus when a tuple is multiplied, it created references of itself which is later converted to a list. Explanation: The above piece of code is used for flattening lists. Explanation: In the above case, both the lists are equivalent but not identical as they have different objects. Explanation: unpack(*x) unpacks the list into the separate variables. Now, a=1 and d=4. Thus 5 gets printed. Explanation: places1 is an alias of the list places. Hence, any change made to places1 is reflected in places. places2 is a copy of the list places. Thus, any change made to places2 isn’t reflected in places. 9. What is the output of the following piece of code? Explanation: The elements 1 and 2 are first put into separate lists and then combined with a space in between using the join attribute. Explanation: First, map converts the number to string and then places the individual digits in a list. Then, sum finds the sum of the digits in the list. The code basically finds the sum of digits in the number. Explanation: The items having indexes from 1 to 4 are shifted forward by one index due to the first for-loop and the item of index four is printed again because of the second for-loop. Explanation: A list is mutable, hence it’s value changes after function call. However, integer isn’t mutable. Thus its value doesn’t change. Explanation: The above piece of code basically prints the index of the largest element in the list. d)	Invalid syntax for sort(). Explanation: The syntax isn’t invalid and the list is sorted according to the length of the strings in the list since key is given as len. Explanation: enumerate(iterator,start=0) is a built-in function which returns (0,lst),(1,lst) and so on where lst is a list(iterator).